Poorboy’s Wheel Sealant applies a clear barrier against dirt, brake dust, tar, bugs, water, and anything else that impacts your wheels. Because these contaminants are unable to penetrate this barrier, pitting and corrosion are prevented and your wheels remain clear and shiny. 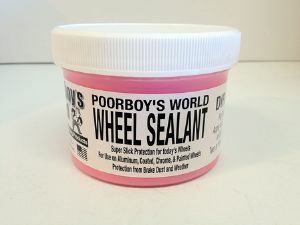 Essentially, Poorboys World Wheel Sealant will give you long lasting protection for your alloy wheels! So why use Poorboys Wheel Sealant? Like any good car or bike enthusiast, you wouldn’t dream of leaving your paint unprotected, but what about your wheels? They encounter all the contaminants that paint does plus brake dust - the worst of them all. Brake dust can eat through clear coated wheels and even cast aluminium and chrome if left unattended. Poorboy’s Wheel Sealant will give a protective coating to block out brake dust and all other contaminants so you don’t have to continuously clean your wheels to keep them in great shape. Poorboy's Wheel Sealant literally seals out contamination so your wheels are easy to clean. All the dirt and debris sit on top of this barrier so they wipe off with little effort. Even sticky brake dust wipes off the slick wheel surface. Water beads on Wheel Sealant just as it does on protected paint, so water spots are not an issue either. You can apply a coat of Poorboy’s Wheel Sealant to any kind of wheel for long lasting protection. Apply Poorboys Wheel Sealant to clean and dry wheels. Using a foam wax applicaor, spread on a thin layer. Leave to haze and then buff off with a clean microfibre towel. Don't leave the sealant to cure for any longer than 15 minutes otherwise you will find it difficult to buff.